We take a look at the full year financial results of Coronation Fund Managers. One of South Africa's biggest fund managers with assets under management sitting at R587 billion as at end of September 2018. Coronation Fund Managers was founded in Cape Town, South Africa in 1993. We are an investment-led,owner-managed business, with staff ownership of 25%.We are an active investment manager with a long-term valuation-driven investment approach. We focus solely on fund management and earning our clients trust through strong investment performance generated over the long term and appropriate product offering. At the heart of the organisation is a single global investment team and process, which is fully integrated with risk management and corporate governance. The board oversees all group operations. The vision of our business is to deliver investment excellence to our clients; excellence of investment performance and client service. The business is built around two primary client markets. The image above shows the share price performance of Coronation (CML) over the last 12 months. And as readers can see, its not been a pleasant year for CML's share price of CML's shareholders. With the shares constantly drifting ever lower. Coronation's 25th year of managing the long-term investments of local and global clients was marked by extremely challenging conditions. Due to the cyclical nature of the business, our revenue stream is highly geared to the returns of the markets and the level of performance that we generate on behalf of our clients. Over the past 12 months, these cyclical pressures have been particularly acute. A very weak domestic economy, combined with meaningful pressure on emerging markets, resulted in the FTSE/JSE All Share Index producing a mediocre return of 3.3% for the year. Emerging markets (as measured by the MSCI Emerging Markets Index) lost 0.8%, while developed markets (as measured by the MSCI All Country World Index) gained 9.8% (both in US dollars). Over the period, the local currency weakened by 4.3% against the US dollar to close at R14.20. Against this backdrop, our total AUM declined by 4.4% to R587 billion (September 2017: R614 billion), but remained flat compared to that of end March 2018. While our average AUM increased by 3.1% for the 12 months in relation to that of the prior comparable period, revenue declined by 1.8% to R3.8 billion (September 2017: R3.9 billion) for the year. Fixed expenses continued to be impacted by the implementation costs associated with changing our outsourced fund administration and unit trust client administration service providers, as well as related systems changes. These were mitigated by a commensurate decrease in variable expenses, resulting in total operating expenses remaining flat year on year - a credible performance in an economy with inflationary cost pressures. Headline earnings per share declined by 3.8% to 420.7 cents (September 2017: 437.5 cents). We are an independent active manager with a long-term, valuation-driven investment philosophy. Although certain strategies, such as our Fixed Interest and Frontier Markets portfolios, have had an excellent 12 months, our South African equity and Global Emerging Markets equity portfolios underperformed over this period. The long-term performance across our entire fund range remains excellent. This includes the full suite of local equity, fixed income, multi-asset class, frontier and emerging market equity products. Of the institutional and retail assets that have been invested with us for a period of at least 10 years, 99.1%* have outperformed their respective benchmarks since inception. The past financial year saw continued substantial investments into our business through various initiatives aimed at enhancing our capacity to deliver world-class service to our significant local and growing offshore business. We have completed the implementation of our new fund administration model, which consolidates our asset administration service across local and offshore portfolios. In addition, we have insourced our retail client reporting and correspondence and will migrate our unit trust client administration to a black-owned business in the final quarter of calendar 2018. While the South African economy remains beset with difficulties, we are encouraged by the actions taken by the current leadership. We believe they will translate into higher levels of confidence initially, and potentially higher levels of investment into the economy which will promote growth over the medium to long term. We are also more optimistic about the outlook for the major South African asset classes which, following a period of very disappointing returns, are presenting above-average opportunities to long-term, valuation-driven investors such as ourselves. The outlook for global asset classes is more mixed, which too has enabled us to construct differentiated portfolios. Sure the markets performance over the last few years have not been great. 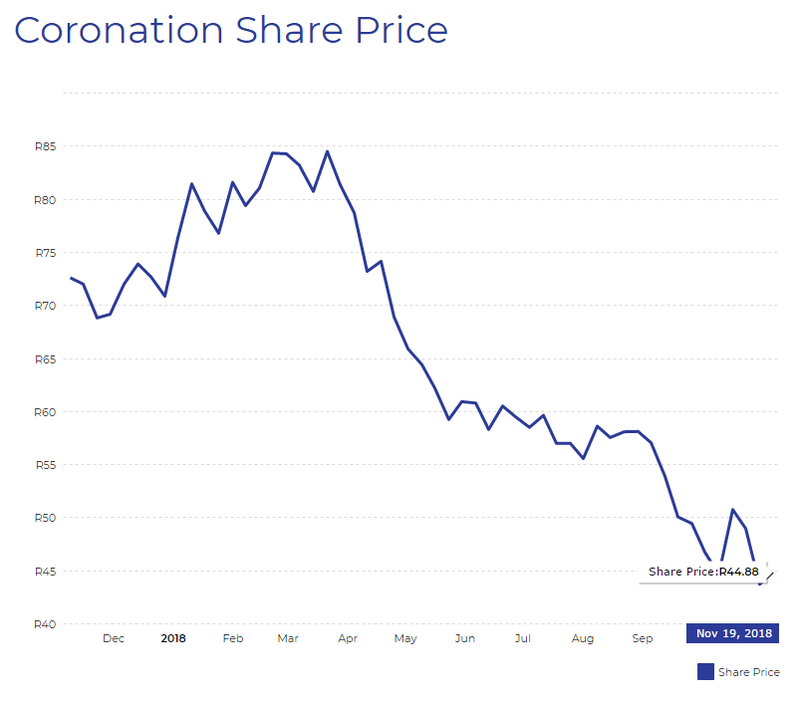 And Coronation, whose earnings is highly geared towards a performing stock market has suffered financially due to this and so has their share price. The question is though, whether investors have punished Coronation (CML) to much? Has the decline in its share price been in proportion to their decline in profits/dividends or future earnings prospects? We dont think so. We think the market has been extremely harsh on Coronation Fund Managers. While the South African economy and its stock market is not expected to shoot the lights out anytime soon, Coronation has solid recurring earnings it generates which is not directly linked to the performance of the markets. So income generation with low overheads is there. They have a very healthy profit margin, and we believe long term investors will be handsomely rewarded should there be any form of recovery in South Africa's economy and its stock market. In the mean time investors can buy the share, fetch a handsome dividend yield of 9.3% (before taxes) and buy the share at a very respectable PE ratio of just over 10. We believe CML is a very strong long term buy and we would encourage investors to buy CML shares at the current price and put it in the bottom drawer. Basically buy and hold, enjoy the strong dividends and reap the capital growth benefits with a bit of patience.